Dr. Kimberly King at Advanced Audiology has a knack not only for hearing what her patients say but for helping them hear what they otherwise might miss. As an audiologist, Dr. King uses a variety of diagnostic tools to assess each patient�s unique requirements. Two important factors she considers are levels of hearing loss and speech discrimination. Dr. King works primarily with adult patients, using a battery of tests to achieve a true analysis of all parts of the ear. Hearing devices fall into two categories: open fit, which usually sit on top of the ear and enter the ear canal through a slim wire or tube, and closed fit, which are molded to the ear and fit snugly. She cautioned that hearing aids are meant to improve hearing rather than restore it and that motivated patients generally do better. �I completely love my work,� Dr. King said. �I find no greater pleasure than helping a person hear well.� She added that the emotion following the fitting of a hearing device (assistive listening devices) is rewarding for herself as well as for her patient. �My patients have taught me a lot. They have taught me to listen, to be compassionate and to be patient,� Dr. King said, adding that they have shown her the importance of developing relationships. 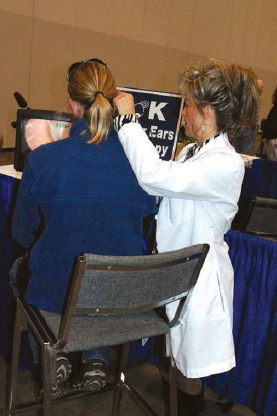 Dr. King�s interest in audiology began when she experienced hearing problems in grade school. When these problems were corrected, her grades improved, and she was more interested in social interaction. �It changed my life,� she said. Before she became an audiologist, Dr. King taught third grade, with hearing-impaired students mainstreamed into the classroom. Her love of audiology prompted her to return to school to earn a doctoral degree. She has worked in Philadelphia and in St. Louis. �Life brought me to the Myrtle Beach area, where I worked at Coastal Carolina Otolaryngology prior to starting a private practice called Advanced Audiology and Hearing Aid Centers,� Dr. King said. Dr. King is married �to a wonderful man� and has two daughters, one about to graduate from high school and one in middle school. Angel, the family dog, is a seven-pound bundle of joy. �They keep me very excited about life,� Dr. King said. Advanced Audiology and Hearing Aid Centers has three convenient locations: 640 6th Ave. South in North Myrtle Beach; 241-C Singleton Ridge Road in Conway; and 1951 Glenns Bay Road in Surfside Beach.